Everyone experiences nervous feelings sometimes - it is a natural survival instinct that helps humans be aware of the environment - but nervousness usually subsides after a while. Anxiety, however, is a psychological state that is characterized by the intense, persistent feelings of worry and nervousness. Often times, there is seemingly nothing to provoke these feelings. There are several types of anxiety disorders, including generalized anxiety disorder, panic disorder, social phobia, and obsessive compulsive disorder. 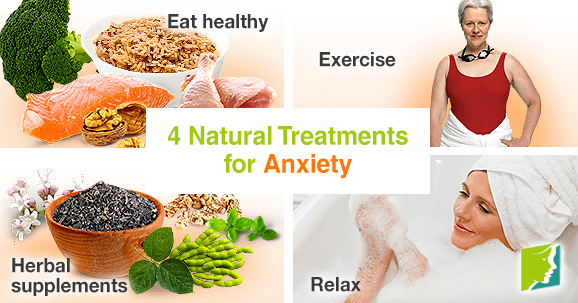 There are various natural treatment options for anxiety, so it is important to find out which one works best for you. It is important to be aware of the common causes of anxiety disorders in order to properly treat the problem. The leading cause of anxiety disorders in women is hormonal imbalance, which is usually experienced during menstruation, pregnancy, and menopause. Other factors that can prompt anxiety symptoms include stress, genetics, certain medications, emotional trauma, lack of exercise, and poor diet. Natural treatments are a low-risk and inexpensive option that can help reduce anxiety symptoms. In order to prevent anxiety symptoms, like irritability and headaches, it is crucial not to skip meals. Making simple dietary changes can be beneficial in reducing anxiety symptoms. Include plenty of protein, fiber, omega 3 fatty-acids, and fruits and vegetables into meals for maximum energy and alertness. An effective way to reduce stress and release “feel-good” neurotransmitters, like serotonin, is to exercise regularly. This means getting at least 30 minutes of aerobic activity every day, or at least three times a week. Exercising can also significantly increase energy levels and improve mood. Walking, cycling, and swimming are all good forms of low-impact workouts that can help ease anxiety. Certain herbal supplements are natural and safe treatment for anxiety. There are two common herbal supplements: phytoestrogenic and hormone-regulating supplements. Phytoestrogenic supplements. These supplements contain compounds with a chemical structure similar to estrogen. They relieve symptoms by introducing these plant-based hormones. Hormone-regulating supplements. These supplements, such as Macafem, can treat menopause symptoms, including anxiety. Macafem nourishes the endocrine system to help it produce hormones at balanced levels. Other herbs. Herbs with strong sedative characteristics have been shown to help ease anxiety symptoms, calm the nerves, and soothe restlessness and nervousness. Chamomile, lavender, hops, valerian, lemon balm, and passion flower are all sedative herbs that are widely used for treating anxiety disorders. These herbs may be taken in supplement or extract form, (i.e., capsules, teas, or tinctures) or you can add these essential oils to a warm bath. Taking time every day for yourself is vital for your overall health and easing anxiety. Taking a yoga class, a soothing bath, reading, or meditating are all effective ways to relax the body and mind. On average, anxiety affects 40 million Americans. Anxiety is a mental condition that can interfere with everyday life and affect personal relationships. There are many natural treatment options that have been shown to be beneficial, that are cost-effective and easy to incorporate into a daily routine. It is important to try out different treatments and find the option that works best for you. If the featured natural treatment options do not work, it may be time to talk to your doctor about therapy or prescription medication.